Kobelco Australia has added a new model to its mini-excavator range – the SK55SRX-6 which the company claims offers improved fuel economy and reduced noise and dust. The SK55SRX-6 is built on Kobelco's highly successful SK55SRX mini excavator introduced in 2011. The -6 model builds upon the SK55SRX introduced in the country in 2011 which Kobelco says has been well-received from the start with its large cab and high auxiliary flow. Among the new features in the latest model include a new S mode of operation for improved fuel economy and the Kobelco iNDr noise and dust reduction system. Kobelco claims the S mode setting on the SK55SRX-6 excavator reduces fuel consumption by 23 per cent compared to the high idle mode of its predecessor. The iNDr system was initially developed by Kobelco for its recycling machines and was then introduced to the larger excavators in the Kobelco range. The SK55SRX-6 is the first Kobelco mini excavator to be fitted with this system. In developing the iNDr system, Kobelco’s aim was to reduce noise levels to at least five decibels lower than the most demanding current standards. 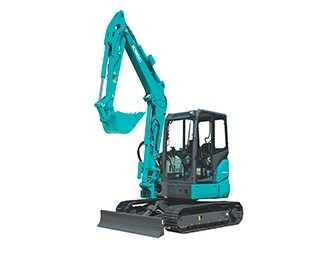 Kobelco adds the system is a substantial advancement for mini excavators that often operate in urban environments where there is high sensitivity to noise and dust levels. The approach taken to controlling noise levels was to have single air entry and exit points so that noise could be more readly controlled. However, as Kobelco Australia General Manager Doug McQuinn explains, the redesigned air flow system has a further benefit. "The air intake is just inside the engine cover and protected by a filter that can be easily removed for cleaning," he says. "This does away with the need to clean the radiator core and greatly simplifies routine maintenance of the cooling system." A new option for the SK55SRX-6 excavator is a LCD monitor for displaying maintenance and operational information. In addition to the aforementioned benefits, Kobelso says customers will also appreciate its hydraulic system design. "The clever three-pump hydraulic system design gives high performance without compromising overall machine functionality," McQuinn says. "The two primary variable flow pumps handle travel and boom and digging function while the smaller gear pump handles blade and swing function." "When it is not being used for swing, the flow is diverted to the digging arm circuit so that the full combined hydraulic flow of 133.6 litres per minute is available." McQuinn adds the new model also features Kobelco’s sturdy undercarriage design, protecting vulnerable areas such as cylinders, lights, hoses from accidental damage. The SK55SRX-6 comes with factory-fitted auxiliary hydraulics to suit both one-way and two-way flow and a standard quick hitch so customers can get to work on their new machine right away. 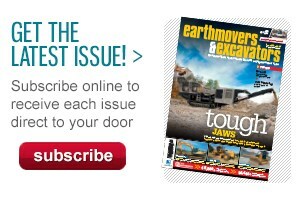 "The SK55SRX-6 might be compact, quiet and economical but it is also one heck of an excavator," McQuinn says. The first batch of the new machine is expected to arrive in Australia this month and will come in both canopy and air-conditioned cab versions. 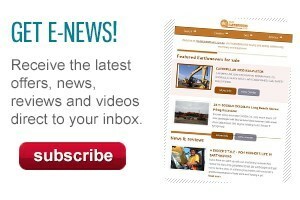 For more information, visit Kobelco Australia’s website. Click here to find Kobelco excavators for sale. Click here to look up Kobelco excavator specifications.